On a recent trip to Port of Spain, Trinidad, I found a little piece of Britain dropped into the sunny Caribbean Sea. Everything from the street names – Oxford Street, Piccadilly, Whitehall, even an Albion Street – to the black and white traffic poles, to the names of the public institutions, such as the Queen’s Royal College (main image), made it seem as if the British were still here. Yet, Trinidad and Tobago gained its independence from the UK in 1962. 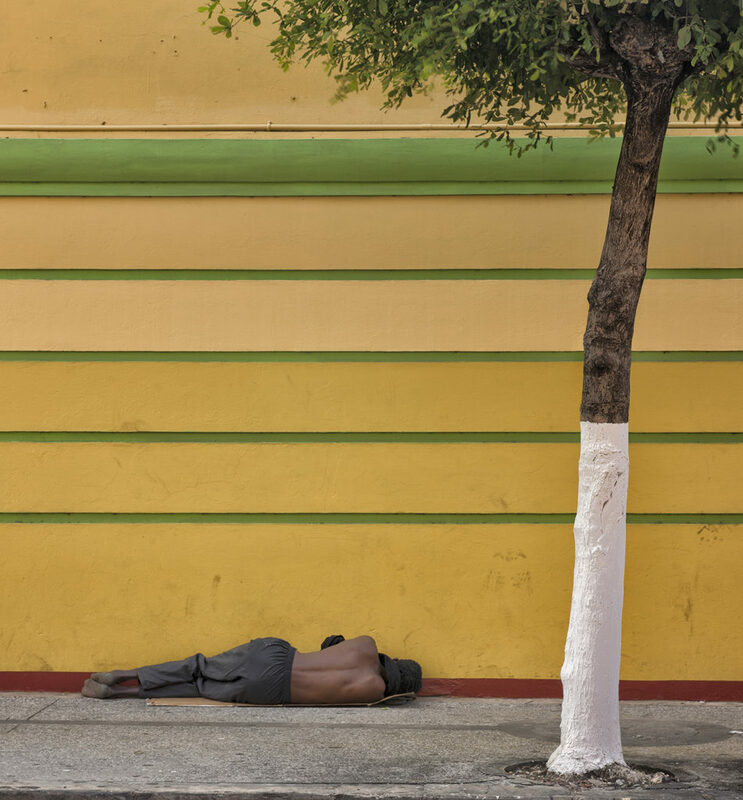 While some things about Trinidad where as I had expected – the sunshine, the palms trees, the relaxed people, the sound of reggae music filling the air – there were two factors that surprised me: the level of poverty and the feeling of insecurity. 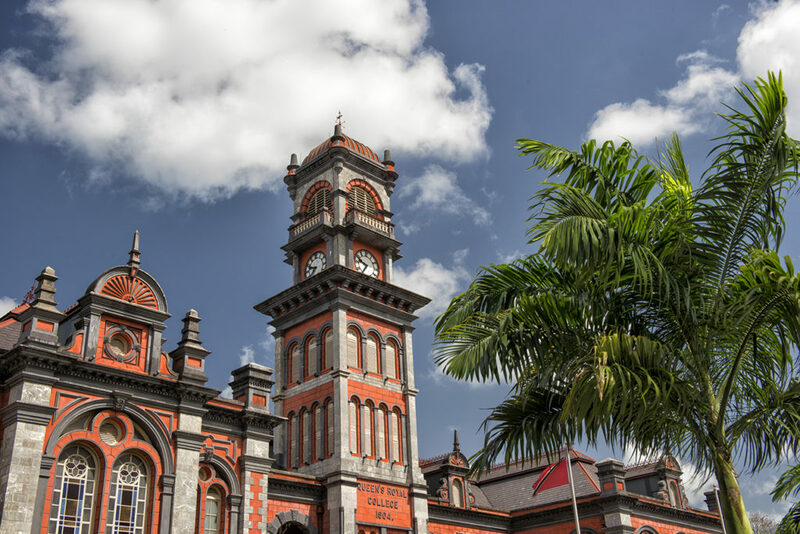 Walking around the streets of Port of Spain, even during daylight hours, I never felt safe. The streets seemed to have been taken over by wild-eyed crazy guys, men in filthy clothes roaming aimlessly, obviously under the influence of drink or drugs. When I would cross the street to avoid one of them, he would cross the street to follow me. Understandably, therefore, I took very few photos: I simply didn’t feel safe standing in one spot for too long, setting up my tripod and pulling out an expensive-looking camera. On the couple of occasions when I did, I could feel eyes boring into me, so I would rattle off a couple of frames, collapse my tripod, then pack my gear away into my backpack as quickly as possible and move on. I shot mostly with my iPhone and with my little Canon G-12 point and shoot. While there can never be an advantage to poverty, one of the photographic benefits of the sorry state of the country’s economy was the number of dilapidated and abandoned buildings, such as those in the third and fourth images. 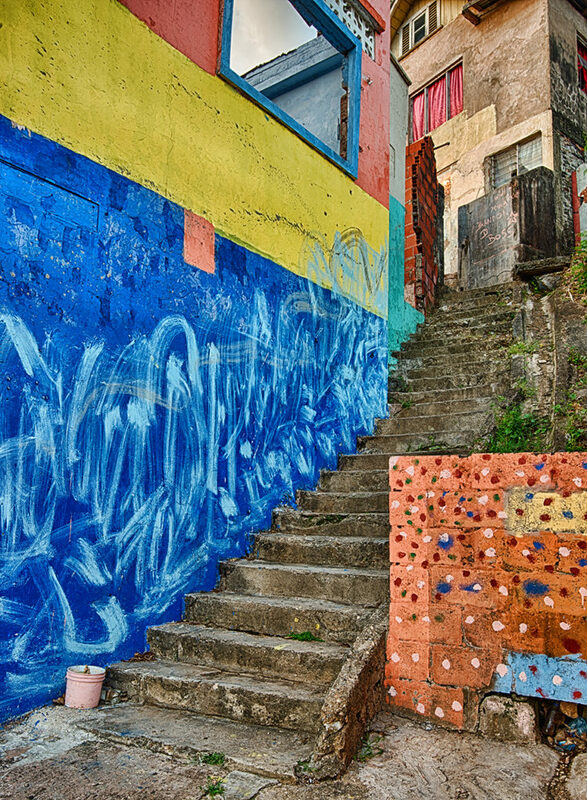 The fact that these buildings had once been painted in bright, even garish colours – pinks, yellows and bright blues, sometimes with polka dots – made them visually appealing in their decay. The grandeur of the public buildings, obviously built, named and left behind by the British, stood in stark, depressing contrast to the dreadful conditions in which many Trinidadians seemed to be living. 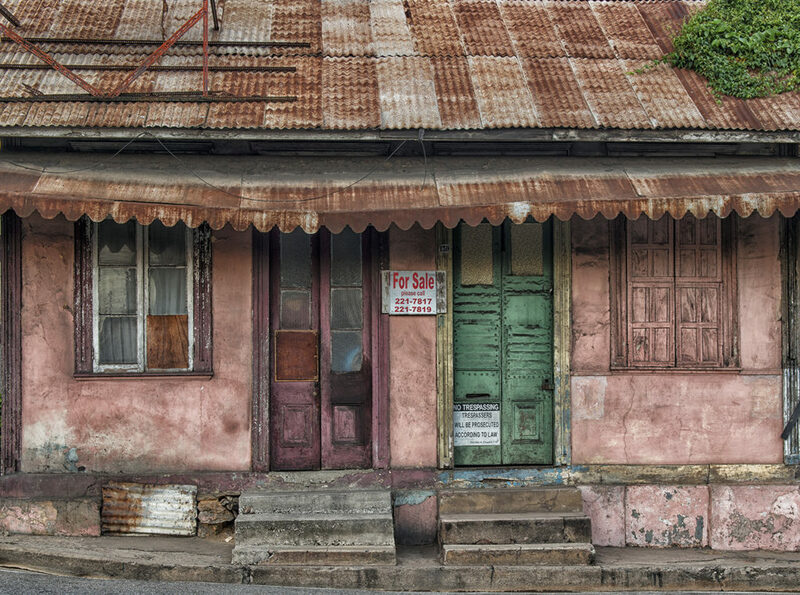 Photographing in the streets of Port of Spain was further complicated by the extraordinarily cramped conditions – the buildings were crammed in next to each other and every one seemed to be tightly encircled by a metal fence – the ubiquitous hanging electrical cables and the bright, hot sunlight. The sun seemed to climb high in the sky within just a few minutes of rising and beat down all day long, usually in a bald, cloudless sky. There seemed to be no such thing as the blue hour and no sweet morning light in the southern Caribbean. What do I do when I go on holiday? I take portrait photographs of people. During a recent photography trip to South Carolina with friends, we visited a number of plantations; places with grand houses, lavish, manicured gardens and peacocks wandering the grounds. One of plantations we visited, Middleton Place, had a number of craftsmen demonstrating functions hat were performed on the plantation in the 18th century. 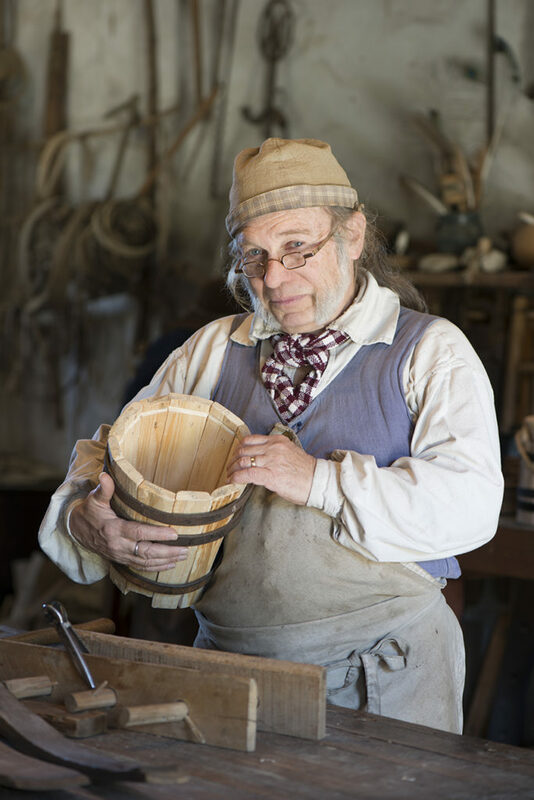 Well, okay, they weren’t craftspeople, they were actors pretending to be craftsmen, but they were dressed up in period clothing and using the same types of implements that craftsmen used two hundred years ago. They included a cooper, a potter and a blacksmith. Watching them work in their little, authentic-looking workshops, surrounded by the tools of their trade, gave me the idea of trying to create some environmental portrait photographs of them. Let me make it clear that I almost never photograph people. I’m not a “people person” myself, I don’t find people particularly interesting photographic subjects, don’t know how to photograph people and feel out of my depth even trying to do so. But, what the heck, I was on holiday, so I decided to give it a try. Unsure of what would be the best way to approach the task, I tried three different approaches but all with the same basic aim of getting the face, particularly the eyes, sharp and blurring the background, while leaving just enough detail in the background to suggest the trade in which the subject was engaged. With the first portrait, of the elderly gentleman who was playing the part of a cooper, I took only one photo. But I took my time setting up my tripod, composing the image, framing the subject, focusing on the gentleman’s face, watching him work slowly and methodically at his bench and getting a feel for where he was moving, so that I could predict when to trip the shutter to capture him at the right moment. Setting all my camera controls manually, as I invariably do, I set the ISO to 100 (the native ISO of my camera) to maximize image quality, selected an aperture of f4.5, to keep the face sharp and blur the background, and the camera’s built-in meter indicated a shutter speed of 1/10th second for a correct exposure. I was shooting with a 105mm macro lens, which I knew was a good focal length for portraiture. Bright, early-afternoon sunlight was streaming into the workshop through an open door to my right, falling diagonally across the subject so that the left side of his face was brightly lit, while the right side was in partial shadow. I waited for the cooper to look up, into the lens, hit the cable release and I had the portrait. One photograph. Shown here as taken (lead image), straight out of the camera, with no post-processing, other than converting the original RAW file to a jpeg. I checked the image for composition, sharpness and exposure on my LCD screen, knew I had a useable image and moved on to the next artisan. Next up was a lady potter. Both she and her workshop presented a different challenge. Her workshop was shallow, maybe only six feet from front to back, and completely open at the front, with no doorway; so the light was flat and frontal. Also, she was young, energetic and fast-moving; she paced around her workshop constantly, hands gesticulating and facial expression changing rapidly, as she explained to the visiting tourists how she made ceramic plates and pots for the plantation kitchen. I knew I would have to adopt a different approach to photographing this lady from the one I had used with the cooper. Not being able to predict where she would be standing at any given moment, I focused on a particular area of her workshop and waited for her to move into it, which she did eventually. Knowing that critical focusing would be more difficult because of her unpredictable movements, I selected the slightly greater depth of field afforded by an f5.6 f-stop. Given that the scene was much more brightly lit than the cooper’s workshop, the camera’s light meter indicated a shutter speed of 1/40th second for a correct exposure. Again, I was using a 105mm macro lens and setting all camera controls manually. I took six photos of this lady. All of them came out reasonably sharp but the one shown as the second image in this blog post, the last of the six, offered the most pleasing, natural-looking composition. In the others, her eyes are partially closed or her mouth contorted into an unflattering shape, as sometimes happens when taking unposed portraits of people. What I like about this image is that, while her face is shown in profile, both her eyes are visible – all of her right eye and most of her left, including, crucially, all of the left eyeball. I also like that the outline of her nose is contained within the curve of her left cheek and that all of her left arm is captured within the right side of the frame. The way that the warmth of the brown wood in the background complements her warm, natural-looking skin tones was a stroke of luck. And I like her natural, smiling expression. Less pleasing is the circular plate hanging on the workshop wall to the right of the frame, which distracts the viewer’s eye from her face. Again, the image is presented here as taken, straight out of the camera, no cropping or other adjustments, other than converting the file type. My third and last portrait challenge – the blacksmith – was by far the toughest and very nearly beyond my current capabilities as a photographer. His workshop was cramped and dark, with a bright fire burning on the hearth and billowing clouds of black smoke rolling out across the ceiling, as the blacksmith operated the hand-pulled bellows above his head. 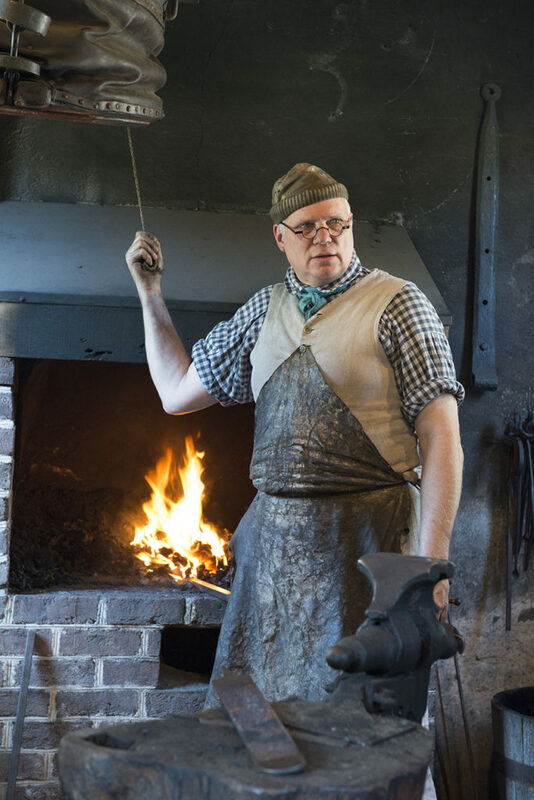 The blacksmith himself, a tall, burly, quick-moving man – a native Charlestonian and former marine in real life – moved constantly around his workshop, talked volubly to the many tourists who crowded into his work space, switched sides from left to right of the fireplace, waved his arms around constantly and frequently turned his back to the camera, all of which made it difficult to capture a sharp, well-composed portrait of him. Given the tigther space, I switched to a 24-70mm lens for extra width, to try to fit his considerable frame and some of the key components of his work surroundings – the fire, the anvil, the bellows – into the composition and bumped up the ISO, first to 800, then to 1600 and, eventually to 3200, to deal with the dark interior while providing a fast enough shutter speed (1/25th sec at f5.6) to prevent him from blurring, despite his frequent, rapid movements. I took nineteen photos of the blacksmith in all. Several showed motion blurring in his face and/or hands because of a too-slow shutter speed (1/6th sec at f6.3 and ISO1600) or else the subject was just badly positioned, with his face partially turned away from the camera. The image shown here was the final one of the nineteen and the best of only four that are useable. Of course, in all of the images, the histogram is blown on the highlight side because of the bright light of the fire, but I think this is inevitable in a scene like this and, as far as I could figure out, impossible to avoid in such a dark setting, where exposure bracketing is rendered impossible by a fast-moving subject. As often seems to be the case, I learned the most from the most difficult challenge. While I quite enjoyed creating the portraits of the cooper and the potter, I found photographing the blacksmith both difficult and stressful. But I was satisfied that I eventually figured out a workable combination of lens choice, f-stop, shutter speed and ISO that enabled me to create a reasonably acceptable composition, with good sharpness in his face and in the background, though the anvil and other objects in the foreground are a little soft. That’s quite enough people photography for me for a while. I’m looking forward to returning to my favoured subjects of flowers, landscapes and old cars and trucks. And, next time I visit Nigeria, I will definitely fit in a round of mini-golf.